Home SharperIron Forums Who's Waving the Baton? A couple of weeks ago, I was at a concert for the Detroit Symphony Orchestra. The conductor is a very warm, personal, gracious person. (He let a nine-year-old girl conduct a song and even wear his shoes!) This conductor said that he walks around his house waving his baton—one of those typical musician things, I guess. Anyway, he said that no music ever comes when he waves his baton around the house. His point was that his skills accomplish nothing without the gifts and hard work of the individual members of the orchestra. He said, “When you applaud tonight, you are not applauding me. The credit belongs to these orchestra members.” I wish we all were that genuinely humble. Like an infection, pride spreads its tentacles into many areas of life. Matter of fact, pride is at the root of every type of sin; yet we often don’t see its far-reaching effects or its long process to eliminate. One way pride displays itself is in self-dependence. “I don’t need anyone to help me. I can do it better myself.” That’s self-centered thinking, and though we would never say such things, we must be honest enough to admit that we have all thought them. Our self-reliance goes completely against Christ’s statement, “Without Me, you can do nothing” (John 15:5). It’s easy to claim our dependence on God and recognize our inadequacies when we are pushed into a corner spiritually, when there are great needs in our personal lives, when we are doing a task that feels insignificant. 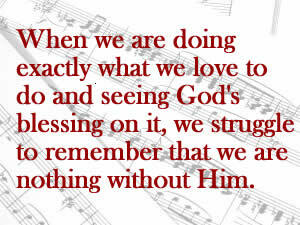 We cry out to God for His help and see our desperate condition. On the other hand, when God is at work in externally obvious ways or when we are doing exactly what we love to do and seeing God’s blessing on it, we struggle to remember that we are nothing without Him. Paul also gives several statements about our need for fellow believers (Rom 12:3-8). We teach the concept of dying to self, but we often refuse to let people help us and will not delegate any duties of our ministry to anyone else. I am preaching to myself because I tend to “lean on my own understanding.” Think of that lady who is odd but desperately wants to help with the missions conference. Do you minister to her by giving her a specific job for the week, or do you think, But she’ll ruin everything we have worked for? Another symptom of the infection of pride is the all-too-common problem of a contentious spirit. Proverbs 13:10 says that “only by pride comes contention.” Do we insist on our having our own way, or do we listen to others’ ideas? How do we react when people disagree with our position? I’m not in any way suggesting that we compromise our beliefs for the sake of good feelings between fellow believers. Even on SI, though, we often sacrifice Christlike gentleness in order to change the opinion of those who disagree with us. An argumentative spirit often leads to the next result of pride—anger and bitterness. We are appalled at the cases of assault we hear about in the media and even in the people we counsel. We are shocked by the violent acts that permeate some neighborhoods and cities. Our verbal assaults and seething bitterness are really no different than these acts of violence. The Bible has much to say about anger. Don’t be too quick to rationalize your behavior because “it’s just righteous indignation.” I would encourage you to read Robert Jones’s book Uprooting Anger. He has a couple of chapters on the process of evaluating whether our anger is righteous or just self-rule. All too often, the anger we justify looks nothing like Christ’s anger because it is rooted in getting our own way. We are to “put away anger, and wrath” (Eph. 4:31). It’s in the context of the filling of the Spirit. That is because our temper is so filled with self that controlling it must be the Spirit’s work, not that of our flesh. What about man worship? I have never seen a golden statue made in the likeness of any Christian worker, but we tend to erect our own internal idols, and the desire to be worshiped comes out in our daily actions and communication. Hero worship is everywhere in our modern entertainers and athletes. Within minutes, the story of a guy hitting a ball over a fence for the 756th time is on every media outlet in the nation. The talk is that the ball that was worth $9.95 before the game is now worth half a million dollars. That’s hero worship to an extreme. But maybe we have thought, I will do or say whatever it takes to be pleasing to the people I am ministering to. What about this thought? I hope the other Sunday school teacher sees how much time I put in to getting ready for my lesson. Or I am going to let the other preachers know exactly how many people are coming to my church so everyone will know that I must be doing something right. It’s refreshing to see a faithful servant of Christ whose attitude is like John the Baptist’s. “He must increase; I must decrease” (John 3:30). Recently, a friend and I were discussing pride in ministry endeavors. He said that genuine pastoral humility is the distinguishing mark of a great church. The more I’ve thought about his statement, the more I agree with his assessment. The infection of pride has many other symptoms like a critical spirit, discontent, fear, stubbornness, lack of love, and many more. To eliminate all the symptoms, we must be willing to let God “wave the baton” on the main issue in our lives. We must be like Isaiah and Job and Paul. When they saw God for who He is and saw themselves for who they really were, they couldn’t help but bow in humble adoration and express that humility to God and to others. Joy Wagner taught classes and was the ladies’ dorm supervisor at Northland Baptist Bible College (Dunbar, WI) for 10 years. She works as a counselor at Rocky Mountain Biblical Counseling Center.